SLOW RIDE. TAKE IT EASY. Twenty-six year-old Eau Claire native Zack Barker launched Eau Claire Bike Cab (ECBC) to avoid another summer of working indoors. The pedicab style of traveling has grown in popularity in recent years, becoming part of the landscape of major-market cities such as New York, Chicago, and Los Angeles. For weary travelers seeking transportation, the eco-friendly human-powered vehicles have become a major attraction, and one Zach Barker aspires to bring to Eau Claire. 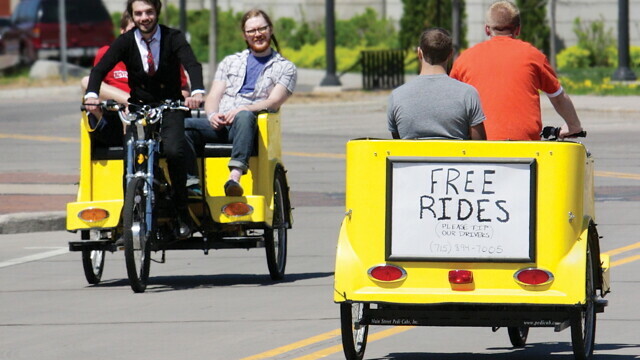 The 26 year-old Eau Claire native just launched Eau Claire Bike Cabs (ECBC) to avoid another summer of working indoors. Barker drove down to Idaho to procure the “slightly experienced” yellow bikes earlier this year. From there he rounded up eight others to help drive the bike cabs. The drivers – all people he’d met through different groups or friends of friends – joined in the green effort. Barker says another one of the big reasons he got into the bike cab business was because of the rapidly increasing gas prices. Using a website, Barker figured out that the mileage on the bike cab would keep roughly 40 cars off the road over the course of the summer.